The aerial shot involves lifting the ball between your 2 bar defensive and goalie man, and then getting it on the back of the defensive man. This man is supposed to be positioned horizontally, and have the ball on his back. Then, once it gets in the right position, it should roll itself over, so that the ball is flipped in the air, and is aimed at the opposite goal. Now, although there seem to be several different ways to flip the ball in air to take the shot, they mostly involve making the 2 bar defensive man flip over quickly in the direction of the opposite goal. How Difficult is the Aerial Shot? 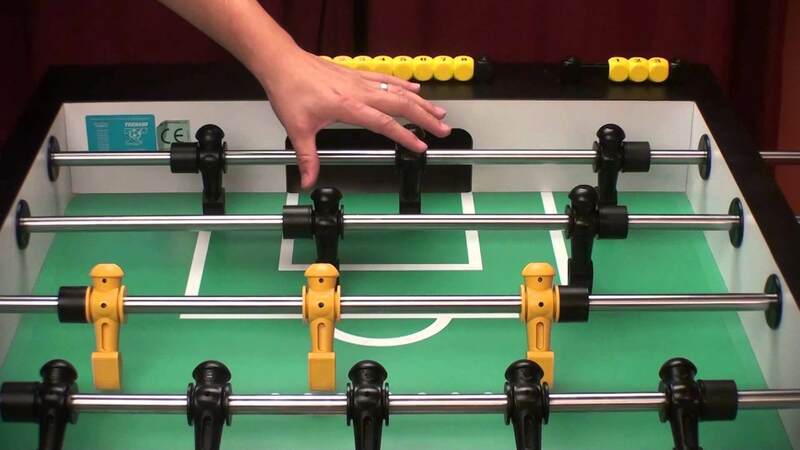 The aerial shot is considered to be the most difficult foosball shot by many. As far as the difficulty rating is concerned, it’s given an excellent, 5 out of 5 foosballs, meaning it’s indeed one of the most difficult foosball shots. However, it’s not the shot itself that’s so very challenging, but rather setting it up. After all, lifting the ball between two men is not something everyone can do, at least not without a lot of practice and you also need one of the best foosball tables. How to Set up the Aerial Shot? As mentioned above, aerial shot can be quite challenging to set up. You may not be able to learn it quickly, and may rather have to put in a lot of efforts and practice to do it the right way. That being said, the first step is to ensure your defensive man in the 2 bar and the 3 goalie man are in front of each other. Then, you need to move them back a bit. At this point, your goalie man is supposed to hit the ball towards your defense man with just enough force (while also making the defensive man return to its original standing position) to lift the ball. You then need to roll both the men towards each other to lift the ball between them. We would like to point out that this is probably one of the most challenging steps involved in setting up the aerial shot, simply because you get a very short time to catch the ball in air accurately. However, once you do that, you need to push the ball use your goalie man to make the ball sit on the back of your defensive man. Again, this is quite a challenging thing to do (many believe this is the most challenging step of the process), as you need to be very accurate with the force with which you hit the ball. Because, if you apply more force than needed, the ball may simply fall back on the table. If you manage to get the ball on the back of your defensive man, you need to roll the man over in a way that it sends the ball towards the opposite goal. If you do it right, you should be able to score the goal.